The IRU World Congress 2018, in Muscat, Oman from 6 to 8 November, is a unique meeting place for leading figures in road transport and trade. Senior business people, government ministers and experts will come together to network, discuss and debate innovative solutions to our most pressing issues on road transport and trade. 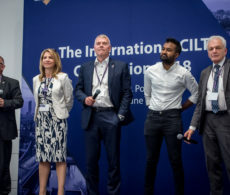 CILT members are invited to join the IRU for 2 days of thought-provoking debates centered on the theme of Innovation on the Move: Leading the Transformation of Transport and Trade. Up to 1,000 attendees from over 100 countries will attend this unique networking opportunity, featuring keynotes from disruptive market players, over 60 high level speakers including ministers, CEOs and thought-leaders, and 20 inspiring sessions examining the big issues. With rapidly evolving road transport markets facing disruption, and with challenging times for trade, it is more important than ever for the private and public sectors to come together around the heart of the industry, the commercial operators who run road transport services on a daily basis. How can the industry embrace and prosper from new technology, innovation and fresh business models? What will automation mean for transport operators? How can we best work with regulators and politicians to enhance trade and connectivity? How can we attract, and retain, the right people to work in our industry? What will urban mobility look like in five, or fifty years’ time? Will diesel continue to fuel the industry, or is there a realistic solution on the horizon for heavy vehicle transport? Government – transport ministries, trade officials, customs and mobility authorities and regulators. Business – transport operators, multinational and regional logistics firms, major industry suppliers, and major transport users. International organisations – UN agencies in transport and trade, multilateral organisations and NGOs. National and regional road transport associations, covering both passenger and goods services. Senior level representatives from the Gulf Cooperation Countries, the Middle East, Europe, Asia and beyond. Media – international and regional trade and business media. With 70 years of experience working directly with global transport and trade decision-makers from governments and the UN, and a network of over 200 national road transport associations and member organisations, IRU aims to keep the road transport industry ahead of global trends. To find out more about the IRU World Congress visit the event website here. Catch up on the Education sessions at CILT International Convention 2018.